The Hyderabad-based IVRCL Group’s move to restructure its infrastructure business in two listed companies will unlock value for the flagship company, IVRCL Infrastructures Ltd. (IVR Infra). It will also clearly demarcate business operations into engineering, procurement and construction (EPC) and build-operate and transfer (BOT). On the other hand, the 59 million shares will increase IVR Infra’s stake from 62.4% to 80.5% in IVR Prime. So, going forward, IVR CL Infra will be able to raise money for BOT and other projects too by merely divesting this holding. IVR Prime Urban was until now primarily into real estate and urban development. The company posted a net loss of ₹ 12.2 crore during the first half of FY10. With a mere ₹ 0 lakh revenue, the company’s interest payable on the ₹ 280 crore loan from IVR Infra impacted the bottom line. 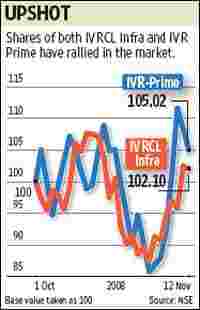 The merger would bring a turnaround for IVR Prime in the long run. It will now have access to toll revenues. Of the four BOT projects in its kitty now, three would be operational by January 2010. Valuations of IVR Infra would be more attractive for those interested in the EPC business but were earlier shying away due to long payback period for BOT projects housed in the same company. For FY2009, the company had posted revenues of ₹ 4882 crore registering a 33% growth over the previous year. Analysts are confident of a 25-30% growth during FY10. The merger therefore benefits both companies by bringing clarity in business operations.